Complex systems such as Phased-Array-Antennas contain a big amount of electronic control units and distributed intelligent subsystems, which are connected in order to exchange data. This sets requirements for gradually faster bus systems with higher data rates and quicker response times. Highest data rates at highest interference resistance without electro-magnetic radiation are achieved by fiber optic cables. A test of such antenna transfer technologies requires tools that are able to read and analyze the transferred data from the fiber optic wire. They also have to give the device a plethora of data via optic output and prompt it with various stimuli. IRS developed an interface for up to 16 in- and output fiber optics for testing and design purposes of such electronic control units and their counterparts. 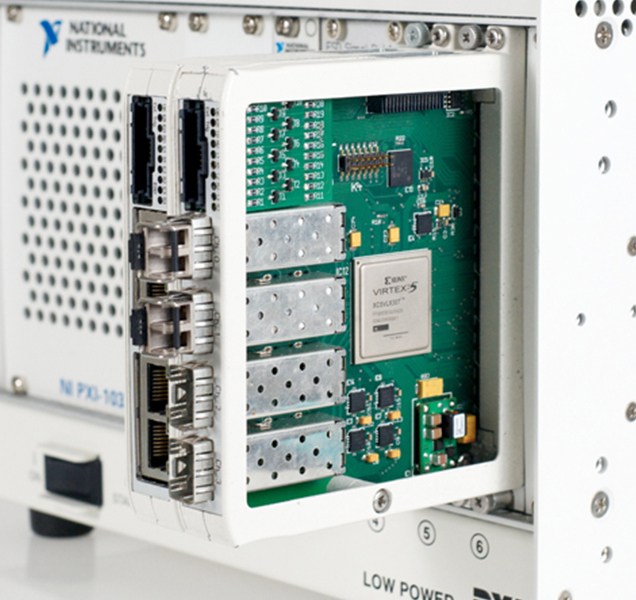 This system is based on FlexRIO-cards by National Instruments enhanced with adapter modules by IRS.